More fall grazing for stocker cattle possible with mixed small grains. 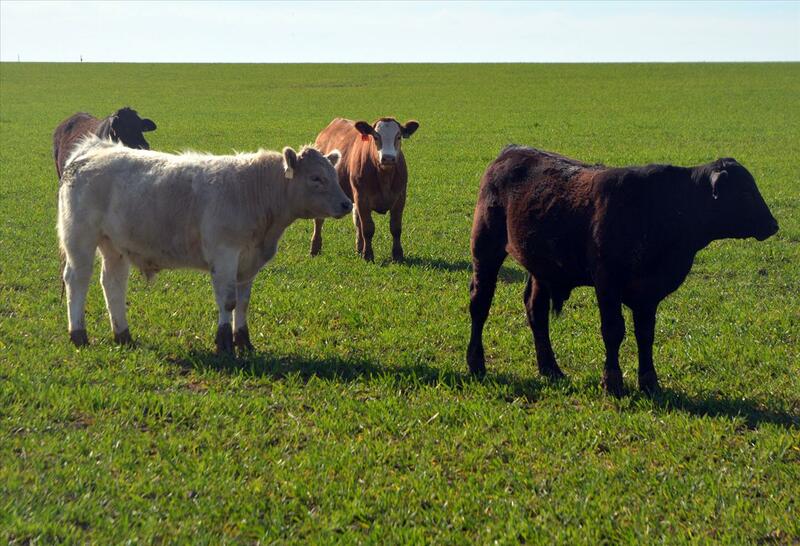 Mixing spring crops with winter wheat might boost forage for stocker cattle grazing across Texas, according to a Texas A&M AgriLife Extension Service specialist. Roughly half of the 6 million wheat acres in Texas are grazed on any given year, said Dr. Clark Neely, AgriLife Extension state small grains and oilseed specialist. Test plots he has grown for multiple years indicate that producers could be getting more pounds per acre of beef on that land. “We know forage production in small grains systems is incredibly important, so we wanted to look at increasing fall forage production without impacting grain yield or spring forage production,” Neely said. Winter wheat remains vegetative all fall and vernalizes in the spring, Neely said. Vernalization is the need for a set amount of chilling hours below 45°F in order for a plant variety to switch gears from vegetative growth to reproductive growth. Without vernalization, the plant is prevented from initiating stem elongation and a rapid growth period in its life cycle. Spring small grains do not require vernalization, and growth is strictly based on heat units, Neely said. If planted early in the fall, spring types will initiate reproductive growth and begin stem elongation and rapid biomass production, unlike winter types that stay vegetative until spring. An experiment examining the impact of interseeding spring barley and winter wheat was conducted at three locations — College Station, McGregor and Comanche, Texas — over the 2014-15 and 2015-16 growing seasons. Three mixtures — no spring, 25% spring and 50% spring barley — were planted at four seeding rates of 50, 75, 100 and 125 lb. per acre with winter wheat. “We doubled or almost tripled our fall forage at the 50/50 rate with the spring barley,” Neely said. “This was good news, but the next big question was how the blend would affect spring forage growth. We saw a small decrease in the College Station spring growth, but there was no impact at Comanche. No spring yield data were available from our third location due to wet field conditions. He said the seeding rate was not significant at either location for straight wheat, but planting at the 75 lb. and 100 lb. per acre seeding rate generally optimized forage production when doing a 50% blend with the barley. Oat, spring wheat and spring barley interseeding treatments planted at a one-to-one ratio were included in statewide cool-season forage variety trials in the 2015-16 season, where the spring barley treatment ranked first out of 40 entries at Comanche and College Station. These results suggest that interseeding spring barley with winter wheat can enhance fall forage production and, therefore, total season forage yield for producers grazing wheat. “It has been very convincing; we have an opportunity to increase our fall forage without hurting the spring grazing,” Neely said. Continued research will be needed to address impacts on forage quality and to determine if the spring crop will die off or interfere with grain harvest in dual-purpose cropping systems, he said.